David Houston's singing career got off to an early start. He made his first appearance on the KWKH Louisiana Hayride when he was only 13 years old, getting rounds of applause for his unique style. After he graduated from high school in 1953, he went on to Centenary College in Shreveport. While there, he did some television work on KNOE-TV in Monroe, Louisiana and even had his own show on KSLA-TV in Shreveport. 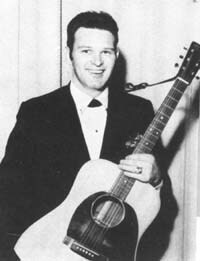 David got his first break when a good friend of his with another unique singing style, Slim Whitman, recommended him to Lew Chudd of the Imperial Record label. Shortly after that, they signed him and one of his first releases was "Blue Prelude" and "I'm Sorry I Made You Cry". Later, Horace Logan signed him on as a regular on the Louisiana Hayride. 10102 A Where Could I Go?